Spring has sprung in Victoria, BC. I start in front of the Royal BC museum to show you some totem poles. This week has been full with yoga class planning and filming in preparation for our trip to Uceulet for March break. We checked out some vlogging cameras and ended up getting a new camera this week, so let me know if you notice when I get the new camera. Tim does some training with YouTube to improve our YouTube channel for you. I went to yoga class this week and I loved what my yoga teacher said, “This is not an aesthetic practice.” In other words, what the pose looks like doesn´t matter. We went to Mount Doug Park so you get to see the gorgeous forest and views from the top. We filmed Namaste Yoga on Wednesday on Mount Tolmie and it was cold! 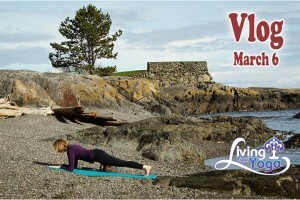 By Thursday it was warm and a beautiful sunny day and we pre-filmed Namaste Yoga 323 on a gorgeous rock on the beach. Then we take you to see a beached barge. Friday morning I was in a procrastinating mood, so I leaned on you for some accountability to prepare some membership classes. I take you to my favourite place to window shop, Rocky Mountain Chocolate factory. You can see them making chocolate caramel apples. We have mail time. I received a card, a postcard and a letter. Then you also get to see me open a box I received called yogisurprise.com and my thoughts on that. Thank you for watching. If you liked the video please give it a thumbs up and subscribe to our channel for a new vlog Monday.